What does a green hotel brand look like, exactly? Well, for one thing, the doors open strangely. A couple of weeks ago I visited the new Element hotel in Lexington, Mass., outside Boston. Although there are many LEED-certified hotels now, this is the first example of a hotel that is part of a brand requiring LEED certification. The two sets of exterior sliding doors to the lobby open in opposite directions (the first door opens to the left and the second to the right) to keep outside air out of the hotel and climate-controlled air inside the lobby. I kept forgetting to zigzag through the doorways and almost walking straight into the second door. Some of the other obvious green features are huge windows with natural light pouring into the lobby and guestrooms (which will be especially welcome on gray winter days in many locations) and the soap and shampoo/conditioner dispensers mounted in the showers. Something less obvious is the hotel’s foundation. The property is surrounded by rock formations. Instead of blasting that rock on the hotel site and taking it to a landfill, it was ground and put into the foundation. “We’re slowly trying to figure out what it means to be eco-friendly in the hospitality industry,” said Brian McGuinness, VP for Element and aloft brands at Starwood. Starwood liked the LEED criteria and wanted to make the buildings green. “We’re not greenwashing this brand,” McGuinness said. Operationally, it’s a challenge because green practices can’t impact the guest stay, he said. 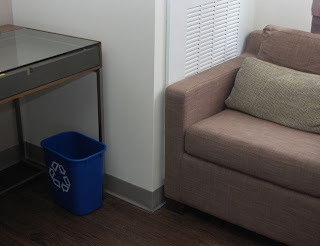 Something seemingly simple like offering recycling bins in the guestroom means putting an extra bin on housekeeping carts, finding a way to sort recyclables (they’re testing multiple bins in some guestrooms for plastic, paper and glass, and one bin in other rooms, which employees will then sort) and hiring someone to haul the recyclables away. On top of that, McGuinness wants to know where the hauler is taking the recyclable materials. Denise Coll, president of Starwood's North America division, said this ultimately will be a requirement for new construction, so Starwood is simply ahead of the curve. While at the NYU International Hospitality Industry Investment Conference in June, I heard one hotelier (who shall remain nameless) criticize LEED as not relevant to hotels. I would love to hear from you developers, owners and operators who have worked on a LEED-certified project. What is the process like, and are you pleased with the results? Is LEED the best certification option for the hotel industry? And how many of your guests run into those funny sliding doors—or is that just me? Thank you for the comment and the link to your blog. The entry about searching for sustainable materials offers great insight on wading through the numerous products claiming sustainability these days. I also was interested to hear about Shaw's “prison wood” line of Anderson flooring. Kudos to the social responsibility on multiple levels. I'm looking forward to hearing more about your Hotel Indigo.